This book explains the fundamentals of digital rights management systems including identifying, tracking, authorizing and restricting access to digital media. You will learn how DRM systems help to protect and enforce copyrights, patents, trademarks, and other forms of intellectual property. Digital assets can take various forms including audio, data and digital video. You will discover how it is possible to provide simple access to authorized users (paying customers) and how to restrict access to unauthorized users. You will learn how DRM systems manage the storage of content, track the distribution of digital assets and ways DRM systems can take action to restrict and remove unauthorized materials. Companies usually desire to allow distribution of digital assets through many digital distribution channels including CDs, DVDs, Internet and Mobile Telephone. DRM systems need to provide various types of access control for these systems. Digital assets can be tracked based on their distribution addresses (IP address) and through unique identifying characteristics of the digital media such as the use of digital watermarks. This figure shows a typical authentication process used in a WLAN system. In this diagram, two wireless data terminals each share a secret key. When one of the devices wants to authenticate the other device (roles can also be reversed), it sends an authentication request and a random number. 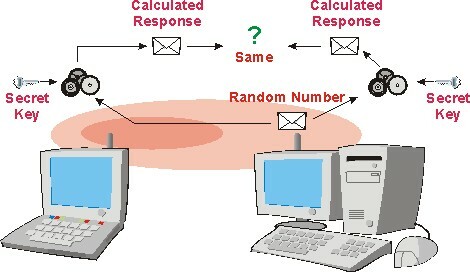 This random number is used by the receiving device and is processed with the secret key with an authentication (data processing) algorithm to produce a result. This result is sent to the originator. The originator uses the random number it sent along with its secret key to calculate a result. If the result received from the remote device with its own result matches, the authentication passes. Note that the secret key is not sent on the radio channel and that the result will change each time the random number changes. This diagram shows the fundamental process used by encryption to modify data to an unrecognizable form. The letters in the original information in this example are shifted up by 1 letter (example - the letter I becomes the letter J). 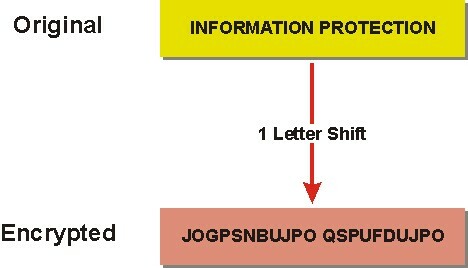 With this simple encryption, this example shows that the original information becomes unrecognizable by the typical viewer. Mr. Lawrence Harte is the president of Althos, an expert information provider which researches, trains, and publishes on technology and business industries. He has over 29 years of technology analysis, development, implementation, and business management experience. Mr. Harte has worked for leading companies including Ericsson/General Electric, Audiovox/Toshiba and Westinghouse and has consulted for hundreds of other companies. Mr. Harte continually researches, analyzes, and tests new communication technologies, applications, and services. He has authored over 50 books on telecommunications technologies and business systems covering topics such as mobile telephone systems, data communications, voice over data networks, broadband, prepaid services, billing systems, sales, and Internet marketing. Mr. Harte holds many degrees and certificates including an Executive MBA from Wake Forest University (1995) and a BSET from the University of the State of New York (1990).